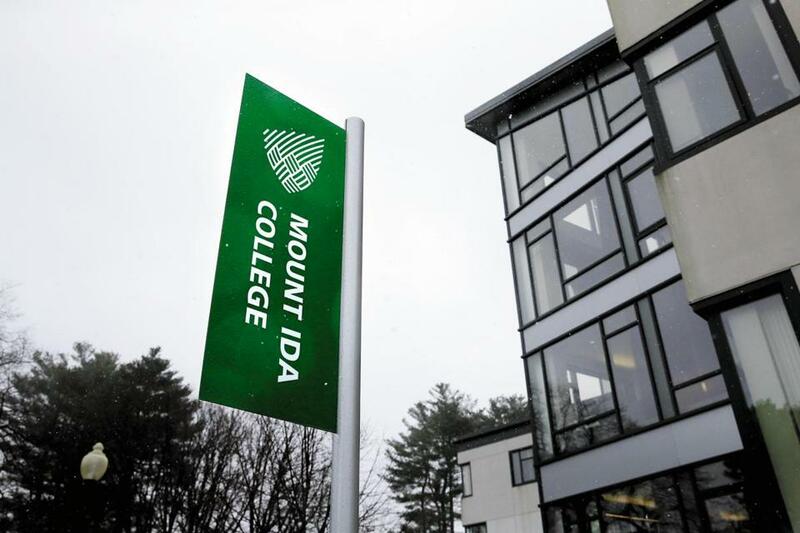 Mount Ida College in Newton. State higher education officials have received about 80 complaints from angry Mount Ida College students and their families reeling in the wake of the news that their school will close next month, according to Carlos Santiago, commissioner of the Department of Higher Education. Santiago met with Mount Ida leaders Thursday to discuss the school’s closure plans after its surprise announcement two weeks ago that it will close next month. The Board of Higher Education has also scheduled a public meeting on Tuesday morning and invited families to air their concerns, Santiago said. The commissioner said he also asked college officials to return for another private meeting next week. The department has jurisdiction to review and approve the closure plans. “We see progress in the information they provided. It’s far from complete, but we think it’s a good faith effort on their part to answer our questions,” Santiago told reporters after the meeting. Amy Nagy, a spokeswoman for Mount Ida, said college officials found the meeting productive. Mount Ida plans to sell its campus to the University of Massachusetts Amherst, which has said it will house students there and perhaps run online and executive education programs on the 72-acre parcel in Newton. Santiago also said the state would need to approve any new academic programs that UMass opens there. Santiago reiterated that he found out about the school’s closure through the press. Colleges are required to submit plans for closure to the department ahead of closure. The abrupt announcement has caused mayhem for Mount Ida students. Santiago said the department is focused on helping students to find places to transfer and ensuring that the many schools and programs volunteering to take them are legitimate and approved by the state. UMass announced earlier this week that it plans to take over the school’s veterinary technology and dental hygiene programs. That plan, for example, would need approval from the Board of Higher Education. Santiago said his department is willing to work on all this as quickly as possible so students can have a plan for the fall. He said he is especially concerned about students whom Mount Ida admitted for the fall and now are trying to find new schools. UMass has said Mount Ida students in good academic standing will be offered automatic admission to UMass Dartmouth. Santiago, however, said his goal is for students to have options for where to transfer. “No one campus or institution has a monopoly on where these students are going to go,” he said. Santiago shied away from questions about the anger the purchase has caused among UMass Boston students and faculty, who feel slighted because Amherst made the purchase while the Boston campus struggles. He also declined to discuss whether the Amherst purchase was a wise move for the state university system. Santiago said he made several requests of Mount Ida. He asked that transfer advisers stay on campus until the end of the calendar year, to help students find new homes. “We can help the students most by providing the correct information so they can make informed decisions,” Santiago said.